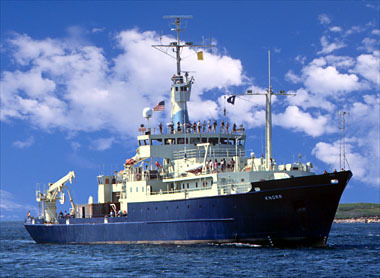 The Research Vessel Knorr is a US Navy-owned ship operated by the Woods Hole Oceanographic Institution (WHOI) for the ocean research community. Launched in 1968, delivered to WHOI in 1970 and completing a major overhaul in 1991, RV Knorr has traveled the worlds oceans to conduct oceanographic research in biology, chemistry, geology and geophysics, physical oceanography, and ocean engineering. It is equipped with sophisticated navigation and communication systems and can accommodate a wide variety of scientific projects. RV Knorr is named in honor of Ernest R. Knorr, a distinguished early hydrographic engineer and cartographer, who was appointed senior civilian and Chief Engineer Cartographer of the US Navy Hydrographic Office in 1860. Mr. Knorr was largely responsible for the success of the Navys first systematic charting and surveying effort from 1860 to 1885.